Alex Kurtzman (& Secret Hideout productions) signed an extension to his contract with CBS, giving CBS Television Studios the exclusive rights to produce all television content created and developed by his company. Which seems reasonable, if they're footing the bill, they have dibs. But what's more interesting is that a part of the press release, it was mentioned that Kurtzman will be supervising the expansion of their Star Trek franchise for television, including a new series, a mini-series, including animation. Now whether that "for television" reference is only referencing their online subscription service, well, I'm not sure. Yet. Remember when Amazon swept Kirkman away from AMC for their own content creation? Yea, well, here it comes! 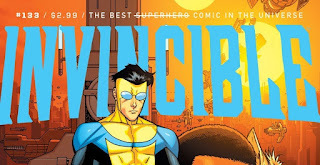 Amazon Studios has given the go-ahead for an animated series called Invincible. It's based on a comic book with the same title, and will be an eight episode season/series. It's an adult-oriented show that revolves around a 17-year-old boy whose father is a superhero, but as he turns 17, he starts developing powers of his own. It's here that he turns to his dad for help, guidance and coaching. Amazon totes it as "suspenseful, action-filled, and emotion-packed, yet poignant and heartwarming at times as it focuses on love, friendship, and humanity. You know, all they had to say is it's from Kirkman and save themselves all the marketing spin! ABC has an interesting new show coming out on August 7th, called Castaways. It's a reality series where 12 individuals are dropped alone, on various islets in Indonesia being forced to survive among washed-up luggage, scattered resources and abandoned structures. While they struggle to survive, the show will do flashbacks to their real lives. The logline: The only way to leave the remote islands is to persevere long enough to be rescued or to quit. I wonder if there will be old fantasy suite structures on these islands? While we're talking about ABC and gritty shows, they've ordered a Roseanne spinoff called The Conners. Roseanne will have no involvement. Lucifer, 4th, moving to Netflix. The Jerry Springer Show has been smite from production. AKA, canceled.